Long ago the place where you are now standing was very different. The grass was green, the air was sweet, and there were Truffula Trees growing all over the place. Brown Bar-ba-loots played under the trees and Humming-Fish splashed in the rivers and lakes. The Once-ler was delighted to see the Truffula Trees because he knew that they would be perfect for what he had in mind. He chopped down a tree and used its “soft tuft” to knit a Thneed. Then the Once-ler saw a little man like creature pop out of the stump of the tree that the Once-ler had felled. 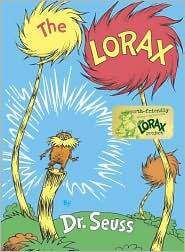 The little creature announced that it was the Lorax and it said: “I speak for the trees.” It asked the Once-ler why he had cut down the Truffula Tree and it was very unimpressed when it saw the Thneed. The Lorax was sure that no one would want such a ridiculous looking thing. Unfortunately he was wrong. In no time at all the Once-ler had built a Thneed factory and Truffula Trees where being chopped down all over the place. The Lorax told the Once-ler that the Brown Bar-ba-loots were starving because there were not enough Truffula Fruits to go around; he told the Once-ler that the Swomee Swans were being poisoned by the smog, and the Humming-Fish were being driven from their homes by pollution. But, alas, the Once-ler only cared about making more money. He did not care that the trees were disappearing, or that his factory was polluting the air and water. Of course, there eventually came a day when the last Truffula Tree was cut down and the Thneed factory had to be closed. The Lorax left the Once-ler and now the Once-ler understands what needs to be done. Will you do your part? This wonderful book has been educating children (and adults) about the need to take care of the environment for many years now. It is considered by many to be one of the best books on the subject for young people and it certainly presents environmental concerns in an easy-to-understand format. Children will be moved by the plight of the trees and the creatures. Better still, they will come to understand that there is something that they can do to help the environment. All it takes is a little creativity, energy, and the wish to being about change for the better. With a wonderful rhyming text which is packed with delightful Seuss-ish words, and with charming illustrations throughout, this is a picture book which will leave readers with plenty to think about.